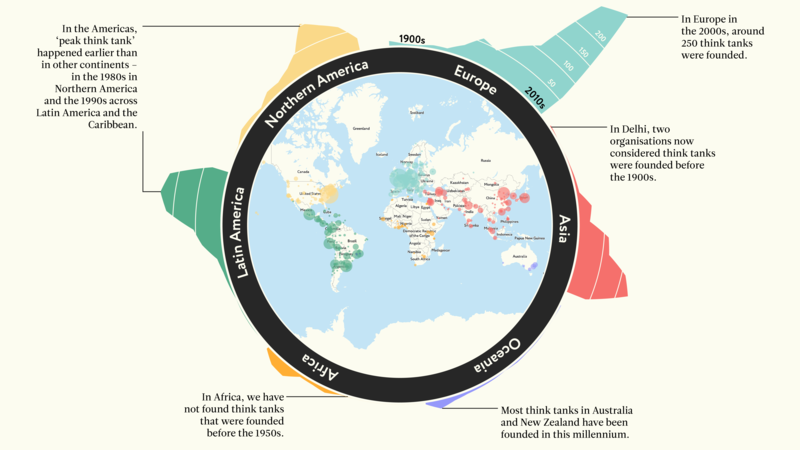 Over the last century, think tanks have been springing up all around the world. But this rapid proliferation has been difficult to track. Think tanks, by their nature, are ‘boundary’ organisations. They do not fit neatly into any box. They often have one foot in academia and another in policymaking. Some even fund and deliver large-scale social change projects. Think tanks also span ideologies and work across a range of topics, from peace and security to climate change and the environment. 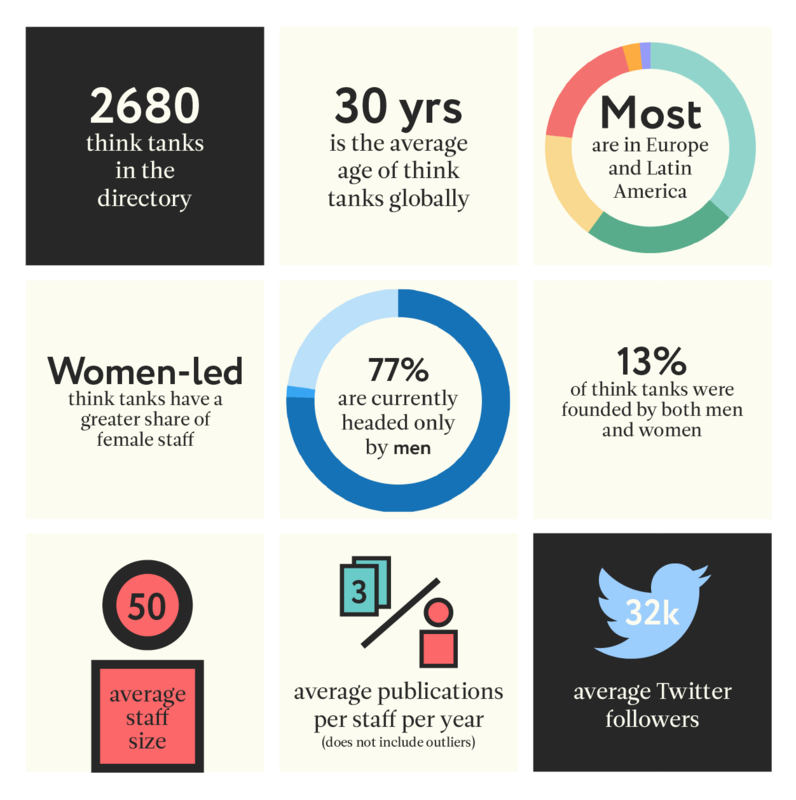 All of this makes it difficult to get a global snapshot of think tanks. But, given the important role that these organisations play in modern policymaking processes, we have been working to gather as much information as possible about them. We have compiled this information into the Open Think Tank Directory. We have used quite a broad and inclusive definition of think tanks, identifying them by categories such as ‘business model’ and ‘affiliation’ (e.g. to governments or political parties) because we did not want to limit the directory too much. This means that those accessing the directory can make better choices about the type of organisation they are interested in learning more about. Beyond that, there are a few things that make this directory special. First, we go beyond just listing the names and websites of organisations. Instead, we provide as comprehensive a view of these think tanks as possible. For example, we have collected information about who founded them and who leads them. We have also recorded their topics and geographies of focus. Secondly, we have included a number of different measures to help ascertain the credibility of these institutions. For example, we have provided the number of publications they publish each year, their social reach and, where we could find it, their annual turnover. In Latin America, we have also started adding information about the gender of the leader and the percentage of the research staff that is female. Finally, we have been transparent about the perceived accuracy of the information listed. Each record clearly indicates whether it is simply imported from similar lists, verified by OTT or whether the organisation has provided the data directly. This is what makes it an ‘open’ directory – not only can others contribute information to it, but anybody can register to download the full database free of charge. Even with incomplete data, the database is already producing a number of insights (see the directory ‘by numbers’). There is still work to be done though. While we have verified the information of more than half of the think tanks in the directory, we know that there are many organisations missing, especially from Asia. We hope to continue to develop the directory and we encourage you to help by suggesting edits to existing information or by adding your organisation if it is missing!